Kerala Literature Festival cordially invites Interested students to attend the meeting on November 26th, 2 PM at Azhakapuri Hotel, Palayam, Calicut. 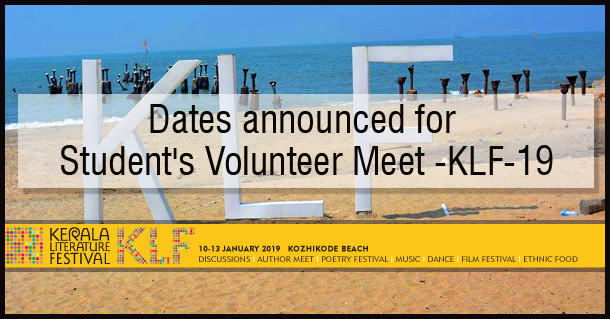 The fourth edition of Kerala’s premier lit fest scheduled from the Jan 10th to 13th promises to be an epic affair in the literary scene of the country with more than 300 speakers including Literary luminaries from the USA, UK, Spain, Belgium, Srilanka, Wales and many more, all set to light up KLF 2019. Venue: Azhakapuri Hotel, Palayam, Kozhikode.